RIM is holding its annual developers conference in Amsterdam this week – aptly titled Devcon Europe – and it marks the first time new CEO Thorston Heins has been given the stage to talk about the company's future. In a rather optimistic keynote, Heins explained that BB10, its upcoming phone software overhaul, and Playbook OS 2.0 prove that RIM is finally getting it right in a fast-changing mobile device market. "We are ready to compete, make no mistake" explained Heins. "Our upgrades to Playbook 2.0 and our vision for BlackBerry 10 reflect our commitment to get it right." Putting an interesting spin on the delays BB10 has seen, Heins noted that this extra time has meant RIM can now be proud of an OS which will be able to stand the test of time. "BlackBerry 10 has been in development for quite some time. We built plans for it 2.5 years ago, began assembling the pieces and have future proofed it to bring it into the next decade," he said. Heins also remained steadfast in RIM's approach to the smartphone market and hinted that there are no major changes on the horizon. "We remain confident in who we are, where our roots are; we are uncompromised in our applications for users and others," he explained. "The smartphone market is still a young market. There's about a billion phones out there, not even upgraded to smartphone. 65 per cent of people are on regular phones. "Smartphone adoption is growing 26 per cent year on year and in BB10 we've built an OS that we are confident in. "I am thrilled to have been passed the reins of RIM, am convinced of our partnerships – we need you – and are convinced of our success." To prove how valuable devs are to RIM and perhaps to entice more to the platform, Heins noted that BlackBerry apps generate around 40 percent more revenue than Android apps. And if a dev wants to make money, he also revealed that 13 percent of BlackBerry developers have made more than $100,000 through making apps for RIM - more than those working on Android and iOS. Heins also used his keynote to outline some new features coming to PlayBook OS 2.0, the updated OS that should be winging its way to PlayBook's soon. 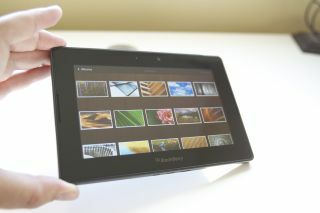 These include something called Runtime Android, which makes it easier to get Android apps on to your tablet. PlayBooks will also get remote control functionality – courtesy of BlackBerry Bridge 2.0 which turns your BlackBerry smartphone into a remote. Other new features include a new-look calendar and contacts section which comes complete with social network integration.